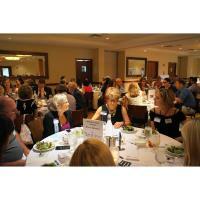 Registration is now open for the Barrington Area Chamber of Commerce (BACC) Network to Success Scramble Luncheon on Thursday, September 20, from 11:30 a.m. - 2:00 p.m. at Pinstripes, 100 W. Higgins Rd., South Barrington. The event is a high-powered networking event that helps local businesses meet new contacts and make business connections. The Network Scramble offers attendees powerful one-on-one networking over lunch. Each participant is assigned to sit at different tables for each of the three courses where they have the opportunity to pitch their business and answer discussion questions to promote their marketing initiatives. BACC encourages businesses to register early, because this event is limited to no more than four professionals per industry and no more than two representatives from each company. Tickets are on sale for $40 per Barrington Area Chamber member and $50 per guest and include a three-course lunch. For an added $50, a table sponsorship will place their company name on one of the networking tables, a half-page color ad in the program, and sponsors receive recognition during live announcements. Event sponsorships include company name on welcome signage, full-page color ad in the program and recognition during live announcements for an additional $150. Attendees are encouraged to provide company flyers for the goody bags at no additional charge, distributed to all participants, and will receive a follow-up contact list of all attendees. For information, visit the BACC website at www.BarringtonChamber.com, or call (847) 381-2525.